Our annual membership drive takes place in August, just as the traditional school year is beginning. Our pack and den meetings also begin at that time, and occur regularly throughout the school year. While we don't meet regularly during the summer months, we do have at least one pack summer activity per month! New members can join at any time and start participating in the fun. Just contact our Cubmaster or the Den Leader in your age group. Or, you can just show up at one of our meetings (click here for our calendar)--and speak to one of our leaders. We will be happy to answer any questions you may have, or assist you with registration! If you have an interest in learning more about our Pack, if you have questions, or if you are ready to get started, please click here and fill out our website form. It only takes a minute and we will get back to you, usually within 24 hours. Den Meetings (meetings of each particular age group, or den) are held each Monday at 6:30 PM at Elm Tree Elementary School, from August to May. 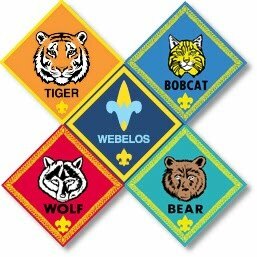 Pack Meetings (when all of our scouts, 1st-5th grade, get together) are normally held once a month, on a Monday at 6:30 PM at Elm Tree Elementary. All awards earned in the previous month are presented, and we usually have a special guest or presentation for the boys to enjoy. Registration for membership in Pack 121 is a $50.00 annual fee each calendar year. The fee for boys joining at the beginning of the school year pay a prorated fee of $20 to cover the remaining months of the current calendar year, then pay the full rate at rechartering time in December. The registration fee pays for registration with the Boy Scouts of America, an annual subscription to Boys Life magazine, and helps cover Pack costs--such as: supplies for pack and den activities; event expenses; and costs associated with Leader Training.